Cam Newton, Quarterback for the Carolina Panthers, first was crowned league MVP on 6th of February, one day before the Super Bowl took place. But now NFL´s most valuable player seems to be a sore loser. After the loss to the Denver Broncos on Sunday, he barely answered questions asked by the press. Instead he walked away and hid his head and face beyond a hood. Of course, all of that attracts the Football Fans´ and the press´ attention although Cam Newton finally tried to defend his behavior. We decided to analyze, in what way the Google News Boxes differ depending on the issue. Who could win in Google News Ranking when it was about to report on him being NFL´s MVP? Are there any differences compared to February the 8th, after he behaved in an unfortunate way? As we will see, there are actually slightly differences. In our previous blog entry we already mentioned that 10 million people in US wanted to know more about Cam Newton and googled him on February the 6th, the day he was crowned league MVP. The following chart shows which News Publisher benefited the most, because it ranked with the keyword “Cam Newton” in the Google News Box. On the upper part of the graph you can see the crawl date and the time. Line 1 shows the News Publishers that hold the first position in the News Box; positions 2 and 3 of the respective News Box for “Cam Newton” follow. News Boxes for keyword “Cam Newton” after he has been chosen for the most valuable player of the season (East Coast Time). It is clear that espn.go.com is the winner of this Google News Box. ESPN ranked in the News Box all day, most of the time on position 1. This News Player was only temporarily pushed off the leading position, e.g. by si.com and nfl.com between noon and 1 p.m. espn.go.com was pushed to the second position between 3 p.m. and 4 p.m. After 4 p.m., espn.go.com is right in front again until late at night. There was more action on places 2 and 3 over the day. While usatoday.com was almost constantly present in the News Box in the morning, this publisher was not there anymore in the afternoon. Sbnation.com was able to establish itself in the News Box for Cam Newton instead. 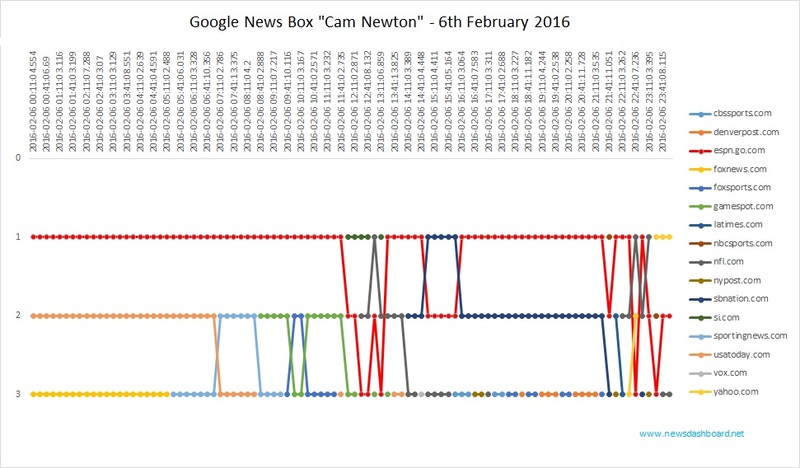 But how did the Google News Box for “Cam Newton” look like the day after he had lost the Super Bowl? Actually it looked slightly different. Espn.go.com still was in the News Box but not that often on the first position as two days before. Especially in the night as well as in the morning of the 8th of February espn.go.com was right in front in the News Box. But as we can see in the following chart, between 8 and 9 a.m. yahoo.com and nytimes.com pushed the site off the first position. 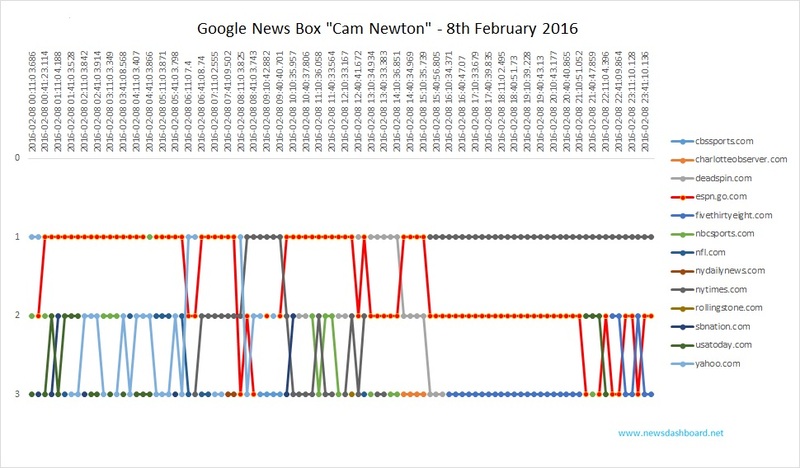 News Boxes for keyword “Cam Newton” the day after he and his team lost the Super Bowl (East Coast Time). Between 10 a.m. and half past 12 p.m. espn.go.com won back position 1 in the Google News Box for “Cam Newton” but later on, the site finally was displaced by deadspin.com and nytimes.com. The latter stayed on first position for the rest of the day (between 3:30 p.m. and midnight). Espn.go.com instead was pushed to position 2 where the site stayed nearly for the rest of the day. Other News Publisher which were in the News Box for “Cam Newton” as well, are – among others – nbcsports.com, usatoday.com and fivethirtyeight.com.